The Italian Renaissance is littered with unfamiliar names. Sure, there are the Leonardos, the Raphaels and the Michelangelos, but there are dozens of others from the Trecento through the early 16th century that we need an encyclopedia to look up. 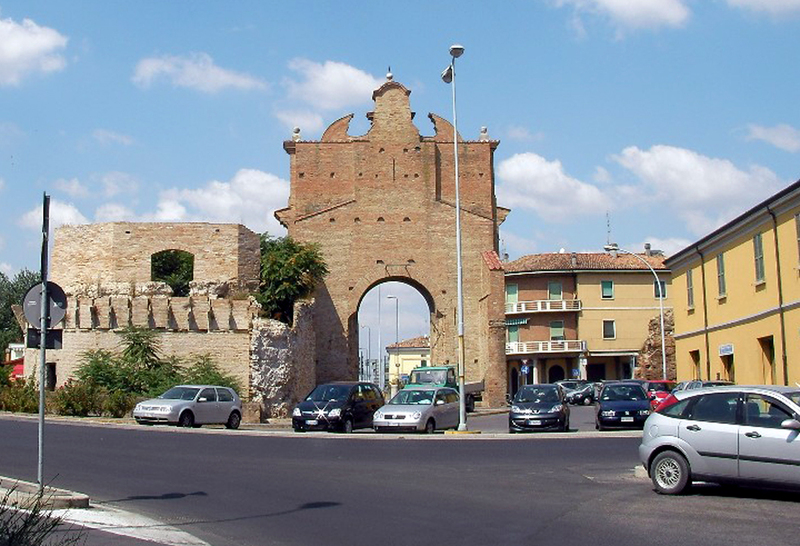 Just take the small town of Forli in northern central Italy along the Montone River. It produced such painters as Livio Agresti, Ansuino da Forli, Guido Cagnacci, the two Baldassarre Carraris, father and son, Francesco Menzocchi and foremost among them, Melozzo da Forli and his student, Marco Palmezzano. All of them competent if conservative artists without which museums (and churches) around the world would be the poorer. It is Palmezzano that drew my interest. In an age of giants, Marco di Antonio Palmezzano (1458-1539) was merely human. He was a good but lesser painter in a Renaissance backwater. So little was his life noted that even his dates are approximate. 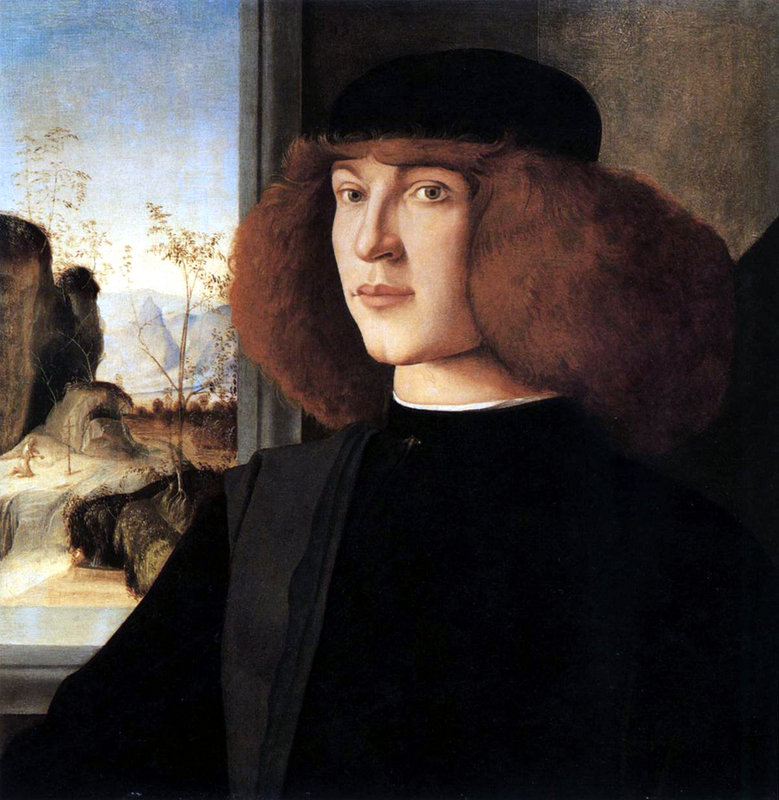 Born in the middle of the Quattrocento, 25 years before Raphael, he died in his 80s, about 20 years after his great countryman’s death. It was a life that spanned the most exciting years of the Renaissance. He was born and died in Forli, a small town at the back of Italy’s knee, remaining there for his entire professional career. During his long life, he provided the necessary religious paintings for the churches and monasteries of the region. We know he visited Rome with Melozzo in 1489 and, after Melozzo’s death, he visited Venice, where the most advanced painters were to be found. But the latest techniques and styles didn’t seem to interest Palmezzano, or maybe they didn’t interest his clients. At any rate, he remained an artistic conservative and his paintings look back rather than forward. 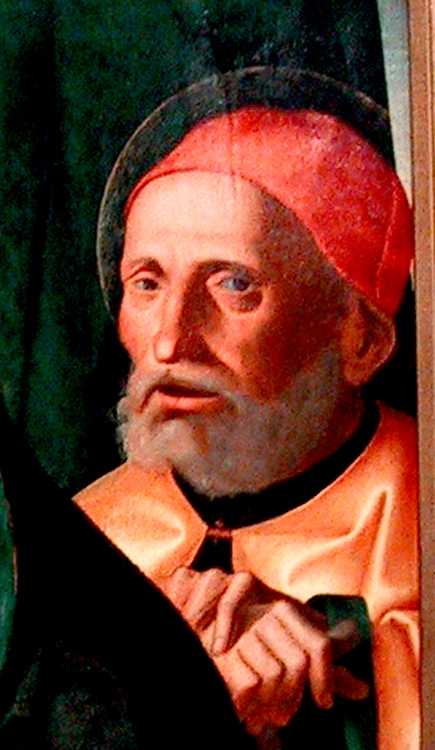 The exact date of Palmezzano’s death is disputed, but a self-portrait as an old man is dated 1536. More than 90 of his works are still in existence, mostly in Forli, but his frescoes for the Feo Chapel in Forli were destroyed in World War II. There is a Holy Family by Palmezzano at the Phoenix Art Museum, and it is a painting that I kept coming back to over the 25 years I lived and worked in that city. One day, I noticed that Marco Palmezzano was right-handed. It wouldn’t be any big deal, but Palmezzano has been dead for 400 years. And because I discovered it myself, this minor bit of information seems much more personal than the few cold facts in the painter’s biography. It brings him to life for me: Even the grave couldn’t hide this datum. It’s there in the painting. Discovering things for yourself is what art is all about. Doing research is fine, but it is your personal interaction with a painting that is the real point. The painting I’m talking about is the Holy Family with Infant St. John, which can be seen at the Phoenix Art Museum. 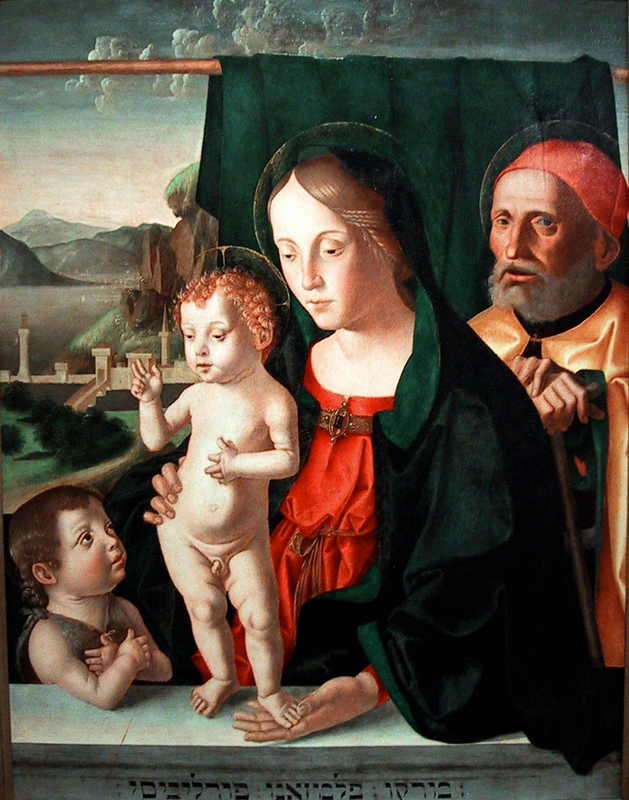 It is a fairly standard oil-on-panel Madonna-with-her-entourage painted by a fairly standard middleweight Italian painter of the middle Renaissance. Palmezzano himself painted dozens of similar works, fulfilling commissions for various churches and monasteries. You have to think of the painter as a small business owner, providing needed objects for the prevailing institutions of the day. Whatever was called for, he was contracted to provide — and his studio would have been not a simple artist’s studio, but a small factory with a variety of employees or apprentices helping out. Palmezzano produced most of the usual religious genre paintings, including this Virgin Enthroned, Annunciation and Crucifixion. There are many things you could notice about this painting, or any painting you are willing to put the time and effort into. ”Noticing” is the operative word. Many museumgoers zip past the pictures on the wall, stopping a few seconds in front of one or another that catches a rushed eye. But artists who spend weeks or months on a painting have put more into their work than you can squeeze out in a moment. It is a case of slowing down to see the roses. So I want to take some time to dissect Palmezzano’s right-handiwork, and to walk you through the process of looking at a painting. I’ll get back to Palmezzano’s right hand later. First, why have I chosen this painting? Primarily because I liked that intense, mineral green that makes up so much of Palmezzano’s Holy Family. It is a hue and an intensity that cannot be seen in reproduction. You can swim in this green. There is nothing intellectual or difficult about the mindless sensuous pleasure that this green gives me, but it got me to slow down and decide to spend some hours with the painting. On second glance, the painting didn’t seem too promising. It is a very ordinary Madonna and child, with a rather awkwardly drawn child, with short, skinny arms and a set of hips that might have done Mae West proud. But there was something that caught my eye and held it. After a few moments I realized what it was. The painting was staring back at me. If you look around the museum gallery at the other paintings hanging there, the people in them look at each other or off into space. 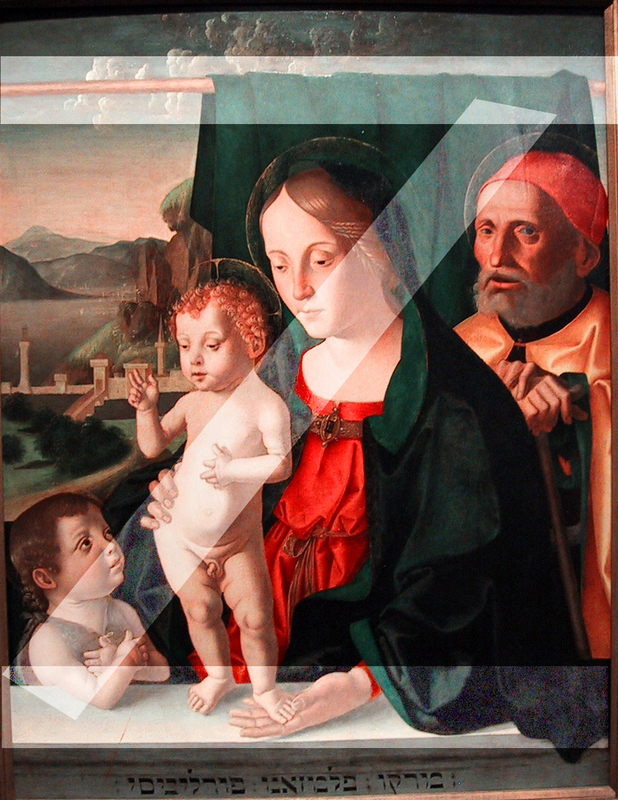 But in Palmezzano’s Holy Family, Joseph is looking at . . . me. There are dozens of things to notice in this painting, from its complex structure of diagonals to the fact that the painter seems to have used no blue. Then, there is the peculiar Hebrew inscription at the bottom, the gold-leaf halos and an oddly gray landscape in the background. All these things are worth noticing, and all contribute to the final effect of the painting, but it is Joseph that gives this painting its particular emotional resonance. In that gaze is the secret of the painting: There are two levels of reality being described here. Mary, Jesus and John are divine or semi-divine. Joseph, like you or me, is merely human. Mary or Jesus could not pay attention to us, it would break the spell, make them too human, too fallible. But Joseph can make the connection. That distinction is enforced by the style in which Palmezzano paints them. Mary is idealized, a perfectly formed human with a look of unmoved serenity in her face. Jesus and John make stylized hand gestures that infants their age couldn’t understand, let alone perform. The Madonna and children are iconic rather than real. We are meant to ”behold” them as symbols of religious faith. But Joseph, all alone in the back of the painting, is not idealized, rather he is a portrait of someone real. We don’t know who, possibly the person who paid for the painting to be made. He is old (a convention for Josephs), and his hands rest arthritically on a walking stick. Mary and the babies are involved with each other; Joseph looks at us. He is one of us. Whatever the painting meant when it was new, it is Joseph’s humanity that speaks most clearly to us today. Portraiture was not an important art form during Palmezzano’s day; no one in Italy could make a living doing only portraits. That is too bad, because it is Palmezzano’s one notable talent. (Here is his Portrait of a Young Man). His Joseph is more real than most of the idealized figures we run into from the Renaissance, an age when what should be was more valued than what was. What was required of Pamezzano were religious paintings. A Raphael or Michelangelo could bring life to their faith. Palmezzano could only imitate the patterns. His sense of color was average, his ability to create design was average, but his ability to draw a human face was above average. It is too bad that it was a talent that wasn’t particularly valued during his life. In another time, in another place, Palmezzano might have been a more important artist. Which brings us back to Marco’s right hand. We know that Palmezzano was something of a conservative, artistically. His figures are a bit stiff, like those in Quattrocento paintings, despite the sinuous contrapposto he has given the Christ. And although he is painting in oil, he continues to use techniques better suited to the earlier tempera painting. Oil’s great advantage over tempera is that paints can be blended right on the panel or canvas and smooth gradations of tone are possible. Palmezzano still uses hatching in this painting. It can be seen as the tiny lines in the shadows of the figures’ faces. Across the entire canvas, the hatching goes from upper right to lower left. Take a pencil and scribble on a pad. If you are right-handed, the lines will run from upper right to lower left. If you are left handed, they will run the opposite. Try to draw them opposite and you will see how awkward it feels. Perhaps the oddest thing about Marco Palmezzano’s Holy Family is that there is no blue in it. Because blue is one of the primary colors, its lack is unusual, though not unprecedented. There are a few reasons we might expect to find blue. First, there is a sky, an ocean or lake and the receding mountains of the painting’s landscape, which we might expect to go bluish in the distance. But in this painting, they are iron gray. Then there is the Virgin, who is garbed traditionally in a blue robe or hood. Blue was the color of the heavens, of which Mary was queen. Blue is so traditionally Mary’s color that probably 80 percent of the early Renaissance images of her conform to the blue scheme. In this painting, Mary’s robe is emerald green. Blue was a special color in the Renaissance. Artists had no tubes of Grumbacher to squeeze back then. Their colors were prepared meticulously from the chemical or mineral pigment stock. The best, most permanent blue was made by grinding rare and expensive lapis lazuli on a stone. When it was pulverized sufficiently — a long and arduous process — it was processed in chemicals. It was called ultramarine, and it was the most expensive color after gold and silver leaf. During the Italian Renaissance, painters did not create canvases and then sell them to people who wanted them. 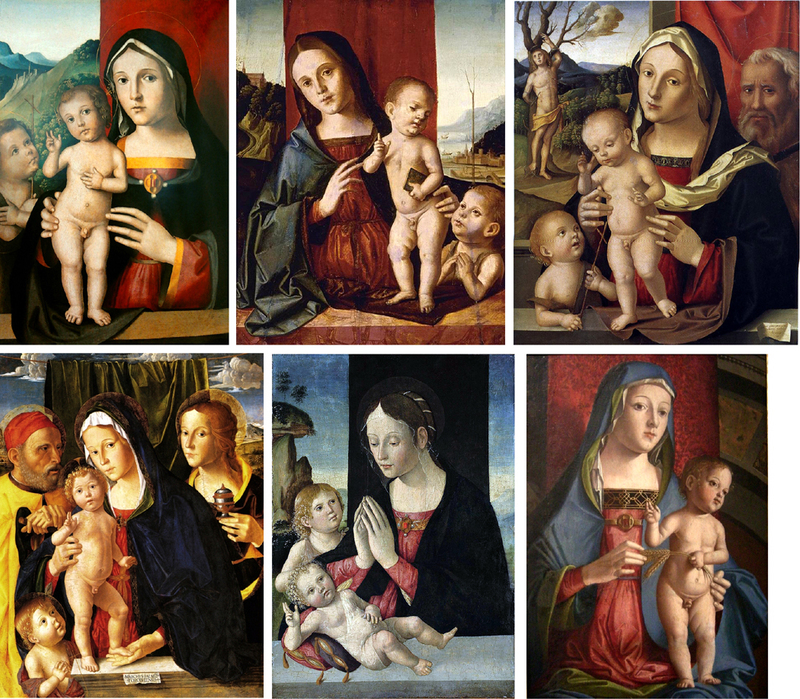 Rather, a client or patron commissioned an artist to make a Madonna and child, or a Crucifixion or a Nativity, of such and such a dimension, with a certain number of figures (some artists were paid according to how many figures were in the painting) and with a certain quality of pigment and skill. Of the hundreds of surviving contracts between painter and client from Italy during those years, about half mention ultramarine specifically, and what quality of ultramarine the artist is required to use. No other pigment is named regularly. Reds, greens, yellows can take care of themselves, but ultramarine would add significantly to the final cost of the painting, and so the client wished to protect himself contractually against inferior substitutes. It was a case of caveat emptor. Well, Palmezzano, in a small town not so rich as neighboring Florence, Bologna or Venice, well may have been given a commission for an inexpensive Holy Family, with minimum gold leaf and no requirement for ultramarine. This is pure speculation and should not be taken as gospel. But it well may be that Palmezzano, to keep the painting’s cost low, avoided blue altogether, or he may have used a cheap, impermanent blue that 400 years later has decomposed into the hueless gray of the sky and water. In writing this story, I spent about four hours with Palmezzano’s Holy Family, spread over several visits to the museum. It was time I enjoyed immensely. While contemplating the painting, I began to notice things. These bits of information or insight came quite randomly and I noted them on a legal pad as they occurred. Some were thoughts on the iconography or the symbolic meaning of the images, some concerned the design or visual construction of the panel, and some were mistakes that Palmezzano made. — Joseph is leaning on a walking stick that in an apocryphal story once sprouted flowers and designated him worthy to marry the Queen of Heaven. The story was traditional in the Middle Ages and Renaissance. Nowadays, it is obscure to all but Catholic scholars and art-history students. — All four characters in the painting look surprisingly like Renaissance Italians. They are wearing contemporary clothes and jewelry. Mary and the Christ child are blond. Joseph wears a familiar Italian hat. The landscape behind them is certainly not Levantine, but more like that part of central Italy where Palmezzano lived. Either Palmezzano had no sense of historical accuracy, or accuracy was not the point. I suspect the latter; the story is supposed to be eternally true. — Then there is that strange Hebrew calligraphy at the bottom of the panel. If you parse them out, reading from right to left, they spell MRRQW PLMZZANN FWRLWVISI, roughly, given the lack of precise Hebrew equivalents to European languages. That is, ”Marco Palmezzano Forlovisi,” or Marco Palmezzano of Forli. 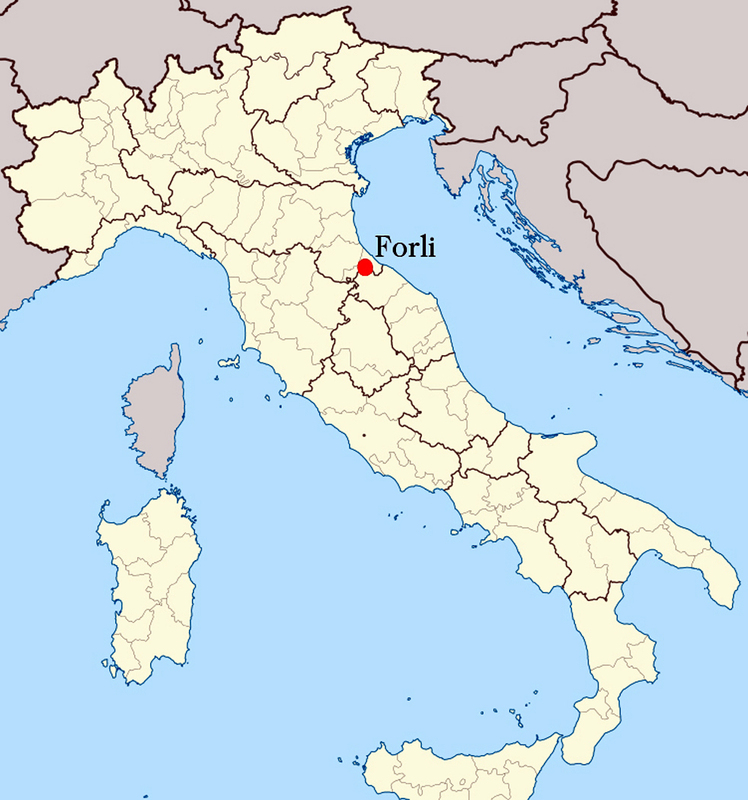 Forli was his hometown. Why he signed his name in a Hebrew transliteration of Italian is not known. Maybe he just liked the biblical look of it. — But that rod does something else. It is artificially parallel to the picture plane, as is the balustrade at the bottom on which the Christ child stands. And midway up on the picture, so is the castle in the background. Those three horizontal lines divide the rectangle of the panel into smaller rectangles. — As a counterpoint to that is the diagonal of heads and shoulders that cut the painting from upper right to lower left. Seen against the three horizontals they make a great big ”Z” out of the painting, with a line through its center, as is customary in Europe. — But there are other diagonals, too. The Christ child stands in front of Mary, who stands in front of Joseph. As we move from left to right, we recede at an angle into the painting. 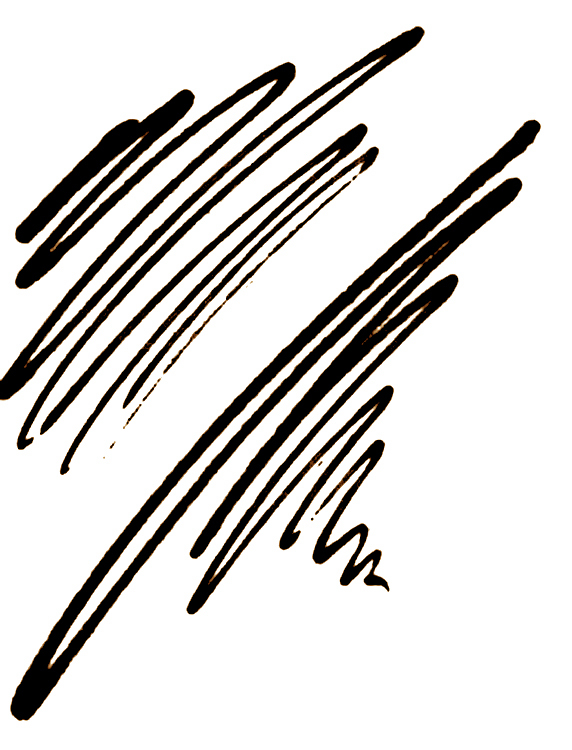 This is also a counterpoint to the strict parallel of the three horizontal lines. — Even more radical is the depth we are asked to absorb from the figures in the front to the landscape in the back. This diagonal moves right to left into the distance, making the opposite diagonal. — That same crossing diagonal is mirrored in the crossed arms of John. Design-wise, a great deal is going on in the painting. — You also might notice that although the figures are overlapped, all eight hands are visible and all are expressive. Joseph’s hands seem cramped and arthritic. 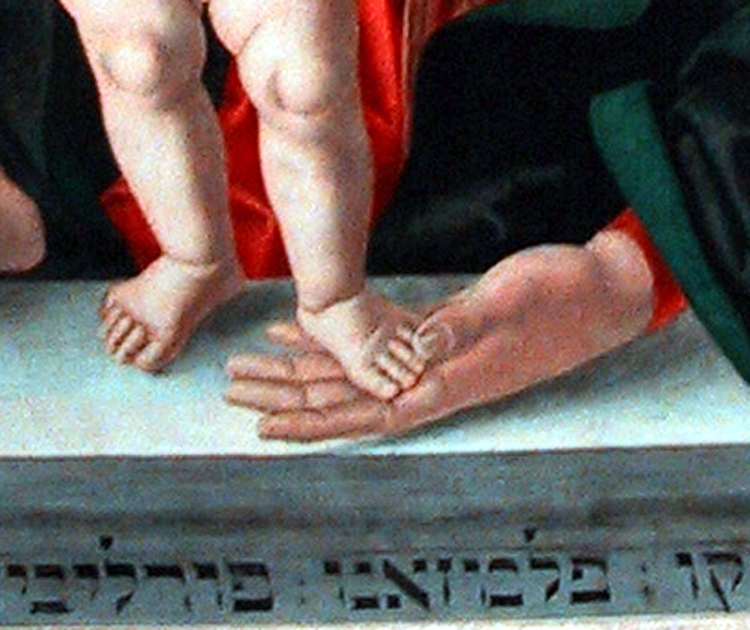 Mary’s hands support her son. John’s hands are crossed in reverence, and Jesus raises one hand symbolically while touching his thorax with the other, as if to point to his mortality. — It is Joseph’s eyes that first make us take notice of him, but his ear can’t be ignored. It is a peculiar ear, oddly orange. It is bent over by his cap and forms a shape that imitates his mouth. That orange tint and odd shape are repeated in Christ’s ear, contradicting the idea that Joseph had nothing to do with the birth. This is family resemblance. That may not be too odd, if we remember that Joseph, Jesus and Mary were understood then not only as themselves, but also as allegorical of the Father, Son and Holy Spirit. Joseph can be understood as a stand-in for God the Father. — Yet, there are mistakes in the painting, several if you can find them. Mary’s hands are out of proportion, much too big for her body and head. And her left hand can be no thicker than paper for it to slide under Christ’s left foot on the balustrade. Palmezzano has poorly drawn that space, making something of an unconformity there. — Other mistakes are more technical. 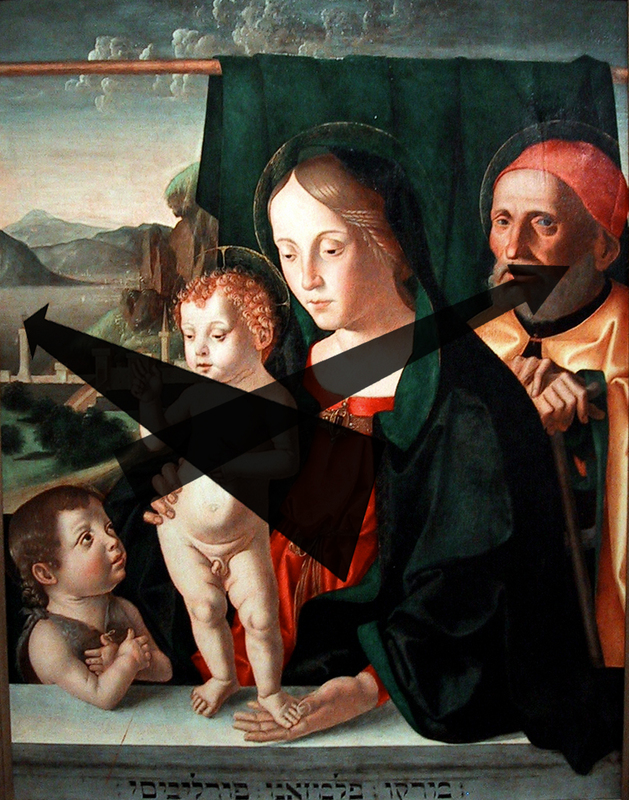 The most glaring is the triangle of orange behind the Christ’s ear: The artist has painted Mary’s mantle first ocherish yellow, as an underpainting, and then green on top. This underpainting helps make the green seem all the more glowing; it is a standard artist’s device. But he misdrew the mantle with the ocher and forgot to cover it up with green in this small area. — You can see more of this orange, on purpose, in the brocade borders of Mary’s mantle, as Palmezzano scratched into the green to expose the orange underneath, making a golden pattern. — In another place, the back of Mary’s neck is artificially circular, from her ear to her shoulder. The shape is geometric rather than organic. The perspective of his castle isn’t too well thought out, either. — And if you crouch down in front of the painting to see the glare of the museum’s lights on the glazed surface of the painting, you will see the painting is pieced together from large, outlined sections, something like puzzle pieces, or, more accurately, like the giornata, or daily working sections that a fresco painter creates in wet plaster. We know Palmezzano worked in fresco. Did he bring his fresco habits to oil paint? There are many more things to notice, but I will leave them to you, hoping you will spend your own time with this painting or another — they all are worth close examination and contemplation.